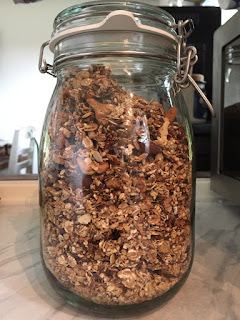 Lets talk Muesli or Granola! Buying organic ones can get pretty pricey and honestly I still have to find one that everybody in this house likes. Plus our kitchen and dining area is too small to have 4 big packs standing around. 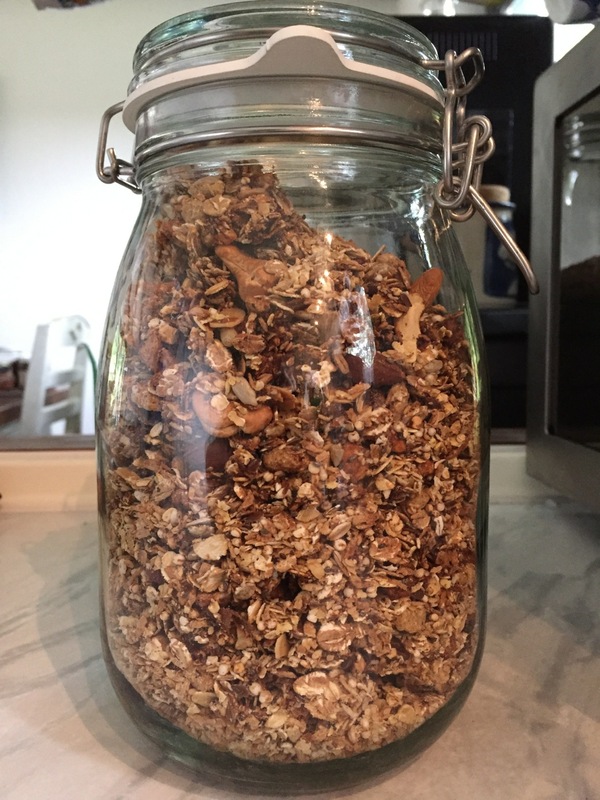 So I came up with the idea to do a basic Muesli with ingredients that we all like. 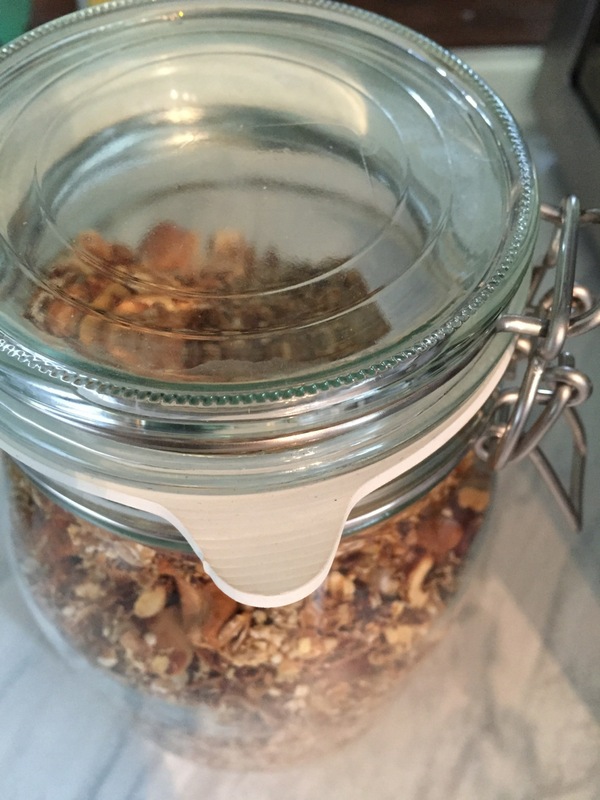 And in the mornings everybody can mix their own little extras into their bowl and all are happy. Most mornings it is just a little cocoa powder, a few cranberries or maybe some small chunks of dark chocolate. This is what I came up with, what works best for us. Mix all well in the largest bowl you can find. I first mix all the dry parts with my hands, and add the applesauce in the end and mix it with a pair of salad spoons. Spread thinly 2-3 salad spoons per baking tray. Do this for 3-4 trays, depending how many you can fit in your oven. Preheat oven to 150C/300F. Put in the first 3 or 4 sheets. Set timer for 10 minutes, then stir well and spread out thinly again. Bake for further 10 minutes. Feel the crunchy bits carefully. If they still feel the slightest bit moist bake a little longer. Otherwise fill hot into a canning glas or other air tight container (I would not use anything plastic!) I use the Ikea ones. They have been doing a great job for the past few years, and they are not very costly. Once you have enough trays baked that your Glascontainer is full, close while still hot! This way it will seal with vacuum. A little side note and out of my own experience... you know those rubber seals with the little pull-thingy on them to break the vacuum seal easier before opening the glas for the first time? Make sure that is somewhere on the side and not caught under the back bracket! It is incredibly hard to get a proper grip of it to pull! I very much like the taste of buckwheat, if you haven't tried it, do! Millet contains a lot of iron, Calcium and Vitamin B, but can taste a little bitter, so you might want to play around with the amount of flakes if you are not to gone on the taste!